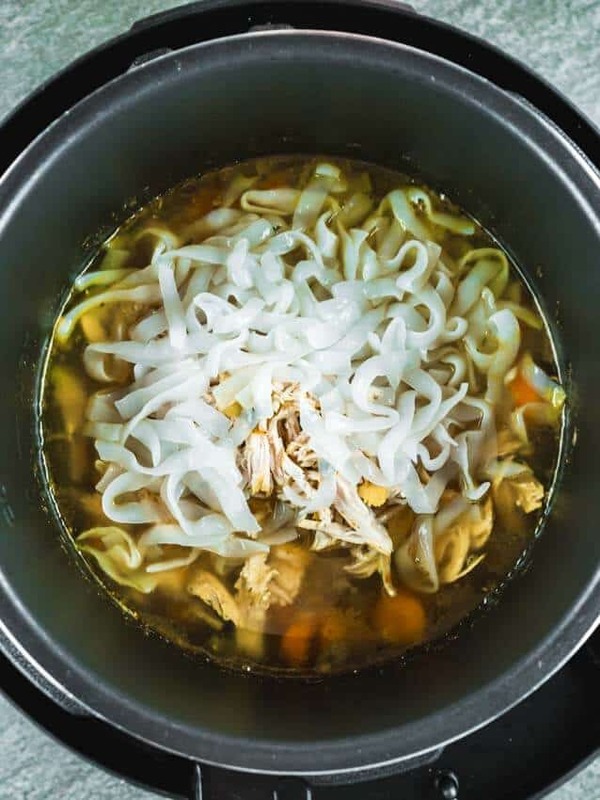 This is a simple and easy recipe for Instant Pot Chicken Noodles Soup. It’s Paleo and Whole 30 friendly and can be Keto and Low-Carb with one easy adjustment. 8 Fresh Ingredients and 15 Minutes in the Instant Pot. Use the “Jump To Recipe” button above to skip right to the recipe card, but don’t be too hasty – as the post contains all the tips and tricks. Ever since we discovered the joy of Shirataki Noodles, we have been daydreaming of the endless possibilities that are now open to us. One of the first things on our list? Chicken Noodle Soup! There’s nothing better than a simple, yet delicious and flavorful homemade chicken noodle soup when it’s cold, or when you have a cold. So, we decided it was high time to put our own easy chicken noodle soup recipe on the blog. 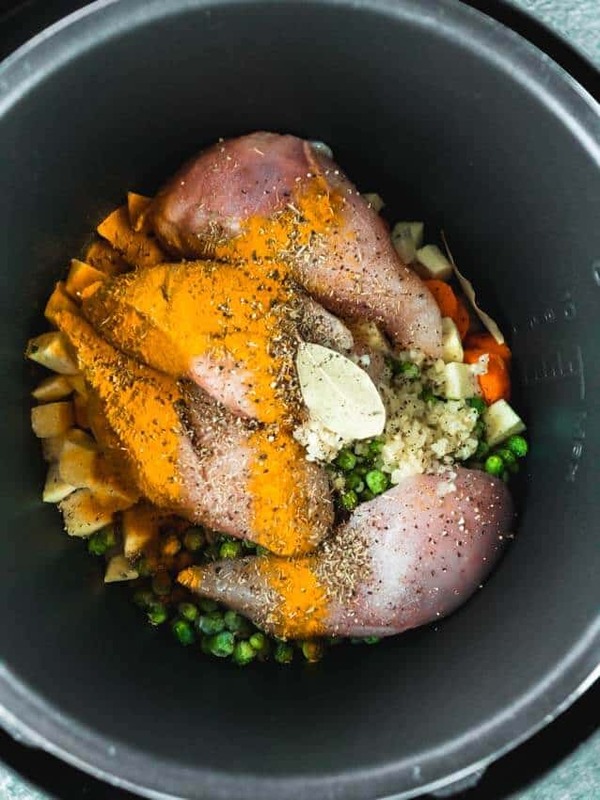 What’s great about this recipe is the fact that everything gets thrown into the instant pot – and 15 minutes later you’ve got a delicious soup ready to be devoured. Even though it’s two completely different diets – we tend to eat Paleo for the majority of time, and a little bit of Keto when we’re craving something more indulgent – something smothered in cheese specifically. The main reason we love the Paleo diet though, is the fact that we can eat potatoes. And boy do we love sweet potatoes! For us, that is exactly what can be added to make chicken noodle soup taste infinitely tastier. It is definitely the ingredient that sets our soup apart and takes its unique flavor to the next level. 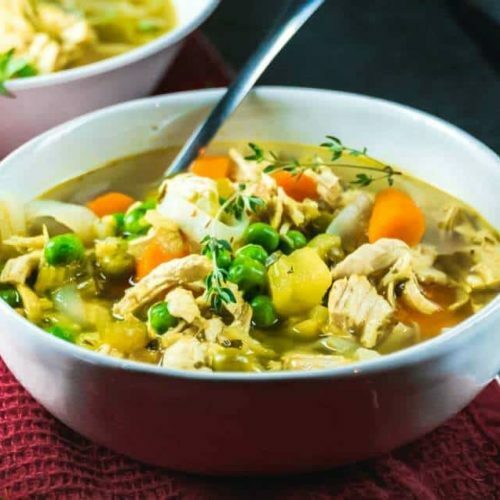 For that reason alone, our homemade Instant Pot Chicken Noodle Soup is the best chicken noodle soup recipe out there! Making chicken soup from scratch is the only way to go. So, let’s dive into the how’s and why’s! How To Make Homemade Chicken Noodle Soup From Scratch? It is my opinion that something like Chicken Noodle Soup should be as simple as possible. And the right mix of simple ingredients can really pack a punch in the flavor department if you do it right! Add the chicken broth, and seal the pot. Set the timer for 15 minutes on high pressure (using the manual setting). Can you put raw chicken in soup to cook? Well, definitely yes. We do exactly that! Once the timer has goes off, we remove the chicken breasts, shred them up quickly and throw it right back. 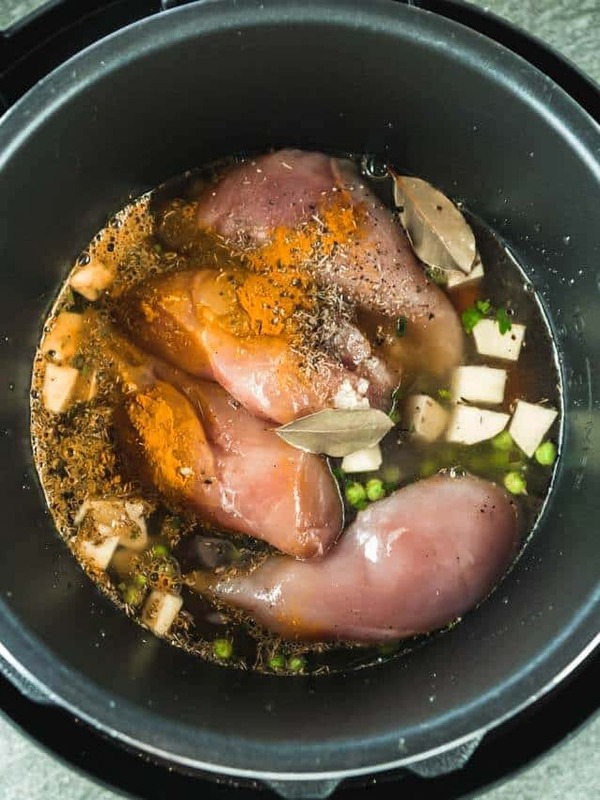 The instant pot is the best way to cook raw chicken quickly and leave it moist and succulent. It’s also great when chicken cooks in soup, because it absorbs all those delicious flavors, makes it extra tasty and keeping it tender. Once the 15 minutes are up, quick release the pressure. Then, remove the chicken and shred it up using two forks, before adding it back to the pot. Last, but not least: Add about two cups of Shirataki Noodles (or your own low-carb noodle of choice) into the pot and stir. We cut the Shirataki Noodles a few times, to make noodles small enough to fit on a soup spoon. How Can You Add Flavor To Chicken Soup? So, the very best way to make a flavorful soup is to keep things simple. Using the right combination of ingredients can really make a big difference. Something we do to really put a lot of flavor into our chicken noodle soup recipe is celery leaves. Yep. You read that right. We absolutely LOVE cutting up the whole celery stem AND leaves for soup, because those leaves contain so much celery goodness. Secondly, the addition of white sweet potato is another amazing way to balance the flavor of the soup – the subtle sweet notes that gets added to the soup really bring the flavor to a whole other level. Finally – adding enough salt throughout the cooking process is a surefire way of making a flavorful soup. It ensures the that the flavor of all the individual ingredients get enhanced and makes a better overall soup! Now, how can I spice up Chicken Noodle Soup? If I want to add a little kick to the chicken noodle soup – I add about a teaspoon of red pepper flakes. It adds some subtle spiciness without overwhelming the dish. Is There A Low Carb Pasta? In this recipe, we use Shirataki Noodles. It is one of your favorite pasta substitutes, when you’re feeling a bit over the usual spiraled vegetable noodles. Shirataki Noodle are thin, translucent and made from a konjac yam. It originated in Japan and is very gelatinous. We love Shirataki Noodles because they have no real flavor of their own – instead they absorb whatever flavors you serve them with. 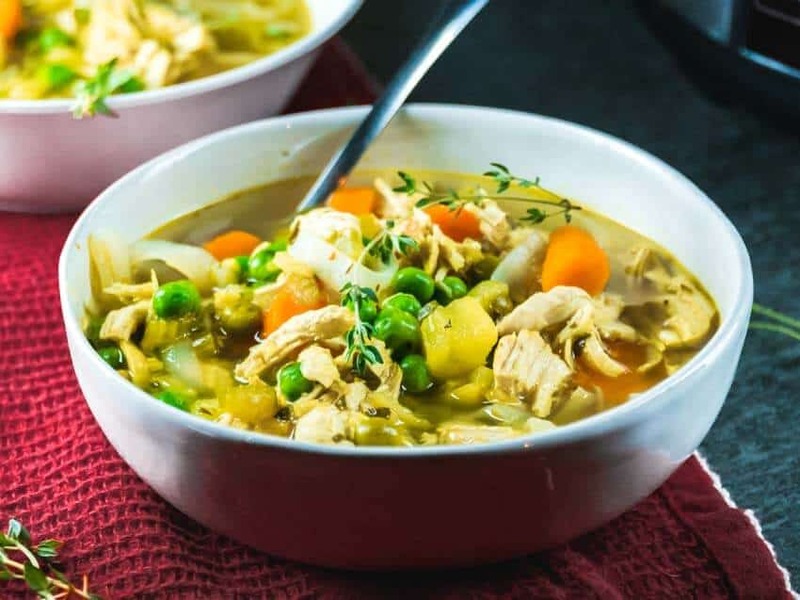 On the topic of low carb pasta, there’s a few things you can do to make a chicken noodle soup low carb, keto and gluten-free. Is Chicken Soup Really Good For You? It all depends on the ingredients you put into the soup! Soup is great when you’re sick, because the natural salts and steam from a bowl of hot soup can help to clear your mucus membranes, as well as soothe a sore throat. Then, whatever you add into the soup (things like celery, onions, carrot, chicken) contains a host of immune boosting antioxidants which help you heal quicker. How many calories in a bowl of chicken noodle soup? Another great thing about chicken noodle soup is the fact that, apart from it’s healing properties- it’s also relatively low in calories. 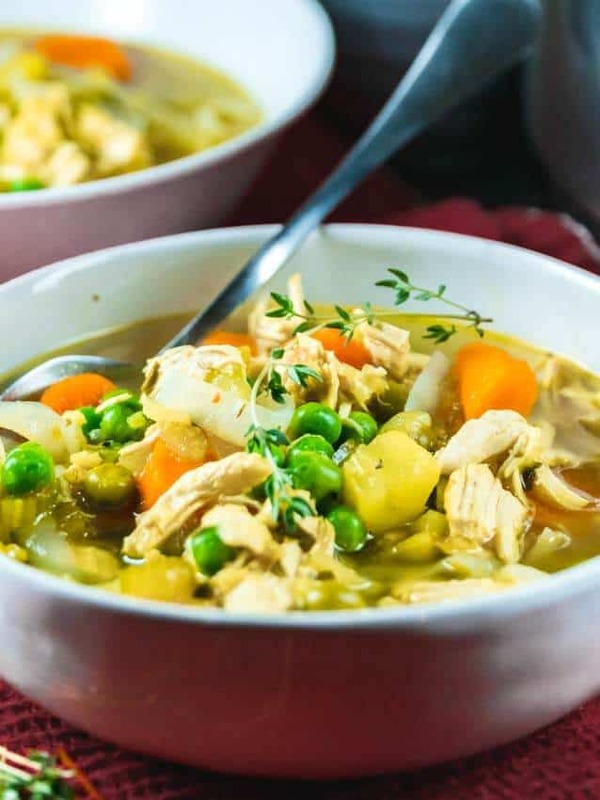 A bowl of our chicken noodle soup contains 136 calories. Even less if you don’t add sweet potato (if you’re on a low-carb diet). Which also makes it a yummy choice for weight loss! What Can I Serve With Chicken Noodle Soup? 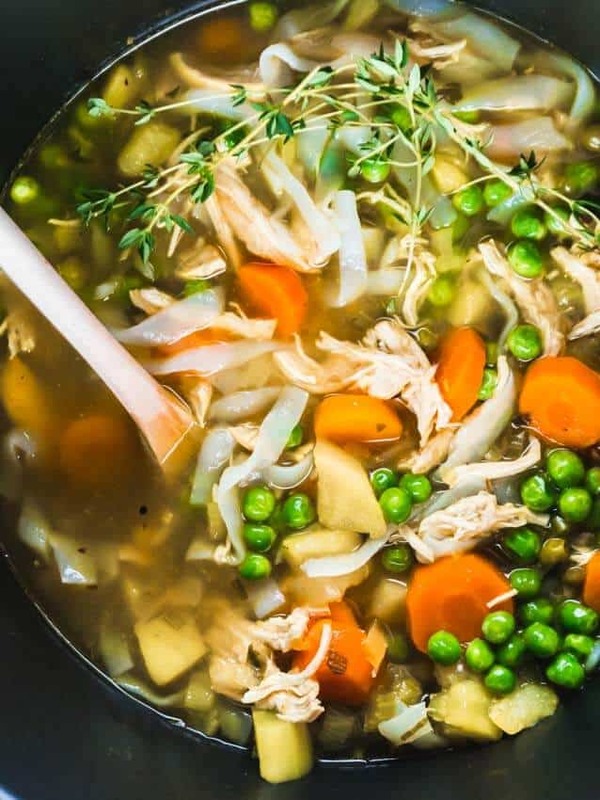 In my opinion, specifically when it comes to THIS Paleo Chicken Noodle Soup recipe – it is a standalone dish and doesn’t need to be served with anything else. It’s got protein, a variety of vegetables and some filling sweet potato to make it a complete meal. If you really do want to serve it with something else, I would suggest a simple little side salad. And then for the final question! Can you freeze chicken noodle soup? The answer is a BIG YES! Chicken Noodle Soup Freezes great. It can also be reheated right in the Instant Pot when you’re ready for it! I haven’t done a ton of experimenting, but found that from frozen, about 10 minutes in the pot does the trick for a whole batch. It probably needs even less time if you’re doing half a batch. 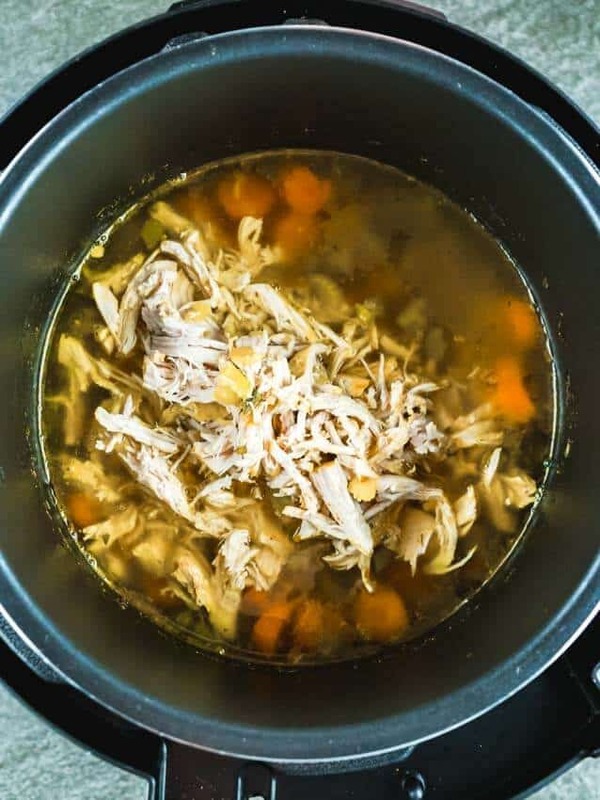 A simple and easy Instant Pot Paleo Chicken Noodle Soup. 8 Fresh Ingredients. 15 Minutes in the Instant Pot. The best recipe for cold weather, or when you have a cold. Gluten-Free. Paleo. Whole 30. Add all the ingredients (except the Shirataki Noodles) into your Instant Pot. Set the timer to 15 minutes on high pressures. (Manual Setting). Quick or natural pressure release. Remove the chicken breasts and shred. Add back into to pot. Add the noodles, and stir until everything is evenly mixed. You can also make this recipe in a regular pot, by following the instructions exactly, but simmering on the stovetop for 30-45 minutes instead of using an Instant Pot. *For a low-carb and keto option: omit the sweet potato.